Saturday afternoon was cool, cloudy and dry — the perfect day for a long walk. J and I headed downtown, as we often do, and this week’s exploration took us to the northwest side of the city. After a good hour and a half of wandering, we headed back toward the river and to Dan & Louis Oyster Bar. This was the second time the promise of oysters had lured us in. The first was in the middle of winter, when the oysters beckoned, but the real draw that soggy day was the prospect of stick-to-your-ribs clam chowder. Neither disappointed, and we knew we’d return. Dan & Louis is an old-time storefront tucked away on Ankeny Street just west of the Saturday Market. A family-owned joint opened in 1907, the feel of the bar is what I imagine a fisherman’s hangout to be — nothing fancy, wood paneling, just the basics. The front bar area has a half-dozen or so wooden two-top tables and a bar backed by liquor of all sorts; a giant wooden ship’s steerer … wheel (what is it called? a helm, yes. ); a lone TV in the corner is usually tuned to some game, race or sporting event. An old cistern from the early Portland days has been preserved near the door to the kitchen. Covered with a Plexiglass window and lit down below, it’s a stop on a local walking tour. Flocks of tourists march in, look down the hole, turn around and leave. Weird? A little. Amusing to watch? Yes. But I’ve dwelt on the decor too much. The real star of this show is the oysters. We ordered the variety pack (my term, not theirs): six kinds, two of each, all plucked from the waters off Washington and Oregon. (Eat local, indeed.) A splash of lemon is my preferred accompaniment, but the plate also offers horseradish and cocktail sauce. Fresh, briny, slurp-a-licious. 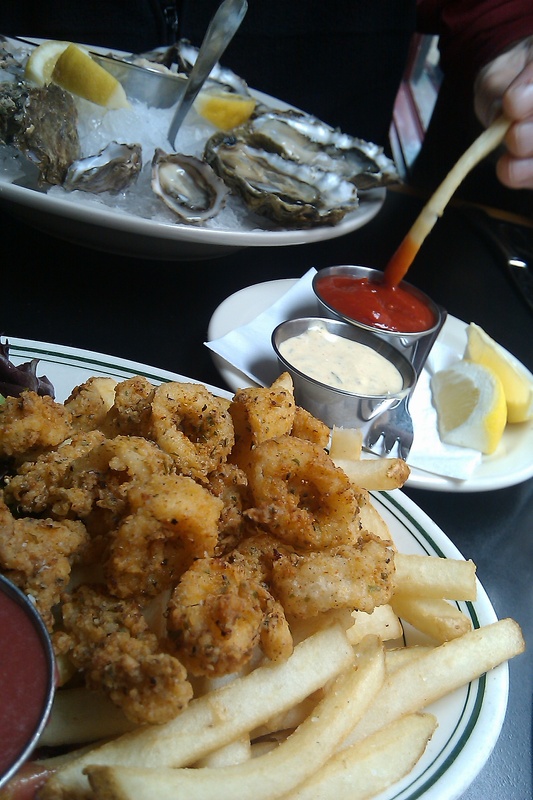 Rather than chowder, this time we went for the fried calamari. Well seasoned/herbed and fried to a perfectly crispy bite, these were among the best for my taste. Everything accompanied by piping-hot sourdough bread with a pillowy interior, crunchy exterior. I think we all know how we feel about that. A couple of glasses of crisp Columbia Valley Sauvignon Blanc to round it all out, and we were ready for our walk home. One of many versions of a perfect Saturday afternoon. Portland is loaded with interesting places. We’ve got to get out more! Thanks for the virtual tour.